Over the last few years, golf has skyrocketed in popularity among girls and women. The game is no longer just for the stereotypical, rich country club ladies anymore. As more and more women pick up the game of golf, big brands are starting to take notice. There is now plenty of golf equipment being made just for women, including golf clubs. In general, the best women’s golf clubs are shorter, and lighter with more shaft flexibility. This is to accommodate for a lower average height and swing speed. There is actually no rule that forces golfers to use specific types of clubs based on their gender. So, if you prefer using men’s golf clubs, then you are free to do so! In fact, some men may even opt to use women’s golf clubs, as they find them easier to hit. Price – You do not want to buy the most expensive, top-of-the-line clubs on the market. First, you will not be able to hit them properly, as they are designed for advanced players. A beginners set will be easier to hit, and give you the confidence to keep progressing. Secondly, it will be a waste of money for you! It would be better to invest in lessons and practice. Complete set vs. individual clubs — As a beginner, we think its best if you just buy a complete set which includes irons/woods, and maybe a putter. As you progress, you can start to buy individual clubs customized to your feel. The Knight Women’s XV II Complete Golf Set is a great starter set for female golfers but is also a nice choice for veteran golfers as well. It uses graphite shafted 12.5 driver and a perimeter weighted putter that is equipped with a precision face to help increase your accuracy. Each club (driver, fairway wood and hybrid irons) has their own head covers. The product also comes with a purple and black cart bag that offers extra storage space as well. 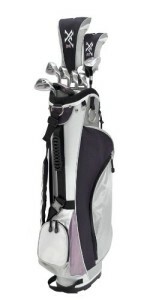 For a incredibly cheap price of $150, this is one of the best value beginner’s golf set for women! Buy the Knight Women’s XV II Complete Golf Set here! Another amazingly designed women’s golf club set, the Callaway Women’s Strata has everything you will need and then some. The drivers and fairway woods utilize lightweight graphite shafts that help you reach your maximum distance. The wedges and irons use perimeter weighing and an advanced sole width technology that gives you higher stability with every swing. The set also includes an easy to hit hybrid (5H) to replace difficult to hit long irons. The T-style alignment of the putter will also add to your overall accuracy. Finally, the included stand bag looks great, is extremely lightweight, easy to carry and has additional pockets, backpack straps, a rain cover and cooler pocket. Overall, the Callaway Strata is one of the best women’s golf clubs sets out there. You will be able to use this set as your progress past the beginner level into intermediate. Buy the Callaway Women’s Strata Complete Golf Set with Bag here! This women’s golf set from Wilson includes a driver, 3 fairway wood, 4 hybrid irons, a 5-PW and a putter. Each club is designed so that it will be easy to use which makes this another great starter golf set. Clubs are specifically designed for women’s standard height between 5’3” to 5’9”. This is a great set of beginner’s golf clubs that are priced reasonably well and offers a good amount of performance to boot. Unfortunately, the included bag is not really meant for carrying, so it does not have kickstand or great shoulder straps. If you plan on using a pull cart or golf cart, then this should be no problem. But, if you want to carry, then you may want to invest in a different golf bag. 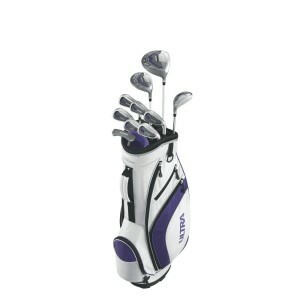 Buy the Wilson Women’s Ultra Complete Package Golf Set here! Cheap, cheap, cheap! This women’s golf set from Confidence is one of the cheapest on the market. Perfect for beginner golfer’s that want to save a bit of cash. Each club in this set uses regular flex steel shafts on all clubs which gives it that exceptional lightweight feel. It includes an oversized driver and a 24 degree hybrid instead of the traditional fairway woods. The 6-, 7-, 8- and 9-irons are all cavity backed as well, which is perfect for beginners. The putter is mallet style with a steel shaft. 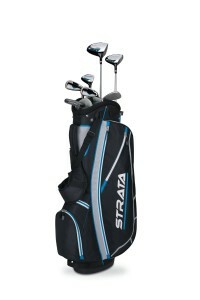 The stand bag that comes with this set features an all weather grip and auto pop-up legs for stability. The overall design and size of each club makes it great for beginners as well as those with a small body frame. If you are looking for some cheap womens golf clubs to get started with, then this set may be for you! 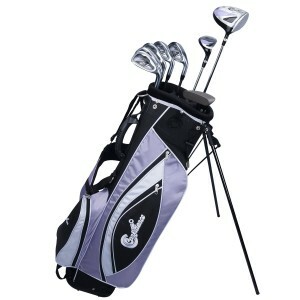 Buy the Confidence Golf Lady Power Hybrid Club Set and Stand Bag here! Here is another great golf set form Wilson. The Hope Complete Golf Set looks amazing, and can be used for beginner to intermediate golfers. This is a stylish golf set that was designed specifically for women golfers. The lightweight construction of each golf club is tailor made to accommodate women’s playing style and swing speed. This allows female golfers to achieve their best possible swing every time. Each part of the club, from the shaft flex, club length and grips were all designed to be optimal for women players. The included cart bag looks great, but is not meant for carrying. From a performance standpoint, the Wilson Hope are one of the best womens golf clubs on the market. Buy the Wilson Women’s Hope Complete Golf Package Set here! These are the current best womens golf clubs available in the market for beginners. Each is developed to be compatible with female golfers and their body structure. Let us know which is your favorite!